What I wanted to mention was the book’s discussion about something called the Hawkmoth Effect, about which it is actually quite criticial. I’ve come across it before, but have never quite understood what it referred to. I may still not quite understand it, but I think it’s not something that is necessarily all that well-defined. It seems to have first appeared in Erica Thompson’s PhD thesis, the relevant chapter of which I’ve just read. [y]ou can be arbitrarily close to the correct equations, but still not be close to the correct solution. Having read the thesis chapter that discusses this, it seems to be regarded as a combination of models being unable to incorporate all the necessarily physics, and non-linear effects potentially coupling to produce unexpected outcomes (Tipping points, for example). So, this seems like a combination of non-linear systems being chaotic (related, at least, to the Butterly Effect) and George Box’s all models are wrong, but some are useful. We know that computational models are not prefect representations of reality. They’re approximations that are typically used to try to understand how a system evolves, and how it responds to various changes. It’s probably impossible for complex models to produce results that are arbitrarily close to reality, but this is not really what computational modellers expect. It’s, of course, possible that something is missing that could have a big impact on the outcome. It’s, of course, also possible that non-linearities might tip the system into a completely unexpected state. It’s clearly worth considering all these possibilities, and I certainly agree with this aspect of the motivation behind the Hawkmoth Effect. I just don’t see that the Hawkmoth Effect is in the same kind of category as the Butterfly effect. The Butterfly Effect is essentially the idea that some systems are very sensitive to initial condition. This chaotic nature of some non-linear, deterministic systems is a well-defined property of these systems. I don’t see how the Hawkmoth Effect is similarly well-defined. It seems to be mainly a suggestion that we should be careful of trusting the results of complex simulations too much. However, one should also bear in mind that physical models are typically based on equations that describe well-understood conservation laws. This means that you can often sanity check the output from complex models using much simpler implementations of these conservation laws; typically you don’t simply evolve the complex models and assume that the output is right. I do think that there is merit to being more aware of the limitations of complex numerical models. I also think that people who develop, and use, computational simulations should be clear about where they have confidence in the model and where they think the model has limitations. However, I do think this is often considered and discussed, even if it isn’t always easy to define. Maybe this is essentially the motivation behind the Hawkmoth Effect concept, but I’m just not convinced that it’s really all that well-defined, or that you can describe the complexities of computational modelling with a simple term like the Hawkmoth Effect. Of course, I may mis-understand what’s being presented. If so, I’m happy to be corrected. Philosophy and Climate Science – Eric Winsberg’s book, which you should read if you want a more detailed critique of the Hawkmoth Effect. Modelling North Atlantic storms in a changing climate – Erica Thompson’s PhD thesis which – I think – first presents the Hawkmoth Effect. An antidote for hawkmoths: on the prevalence of structural chaos in non-linear modeling – A link to Nabergall, Navas & Winsberg (2019), Eric’s recent paper on the Hawkmoth Effect. This entry was posted in Climate change, Climate sensitivity, Research, Sound Science (tm), The philosophy of science, The scientific method and tagged Butterfly effect, CATS, Chaos, Climate models, eric winsberg, Erica Thompson, Hawkmoth effect, Numerical modelling. Bookmark the permalink. ATTP, thanks for this. I would like your evaluation of my attitude/belief/understanding of climate models as they currently exist and as they are currently used. I would welcome input as to where my attitudes etc. are clearly wrong, as opposed to not in accordance with your views, if possible. I think that climate models have been astoundingly successful at showing the broad sweep of climatic changes and how they are affected by both natural and anthropogenic changes. As currently constituted, climate models are not particularly useful regarding some important elements of the climate conversation–that they don’t resolve to regional levels, that they are not particularly helpful in disambiguating between natural and human forcings at a decadal level, just to take two examples. As a follow-on, I have observed that arguments about the efficacy of climate models have largely taken place on the wrong stage–that skeptics criticize models for not perfectly doing what they were not designed to do, and the climate concerned are perhaps forced to engage skeptics in that type of conversation, which isn’t actually relevant. The point should be that models clearly indicate that the combination of natural and human forcings are taking the climate in a direction that poses risks for many of us, risks that we can take some measures to prevent or prepare for. Again, if there are gross errors in my understanding of all this, I would be happy to hear about it. That mostly seems a fair description. Some people are starting to do decadal projections, but I think that getting the initial conditions right for this is difficult. They’re more suited to longer timescale projections. You’re also right that they should have less confidence what models suggest is likely to happen on a regional-scale, than on larger (say continential) scales. Higher resolution will help with this, but we also expect there to be more variability on these smaller scales, so it’s going to still be difficult to be confident in the smaller scale projections than in the larger scales. On the other hand, if we want to make decisions about what to focus on when it comes to adapting to eh changes (sea walls, flood defenses, changes to agricultural practices, investment in infrastructure) then you need to do some kind of modelling at these scales. It certainly won’t be perfect, but it will be better than doing nothing. Climate models are clearly not perfect, but they do a pretty impressive job of representing the global circulation patterns, and seem to do pretty well with giving us some idea of climate sensitivity and changes to the hydrological cycle. On the other hand, they’re mostly scientific tools and we should – in my view – consider all the evidence and not just focus on climate models specifically. With apologies for, as I often do, going sideways to the article. I found this today and think it is relevant to the question of what and why we measure, compile, and compare, though it would be easy to say it’s off topic. I did read through the comments and Willard’s article last night, fwiw. I used to think the top environmental problems were biodiversity loss, ecosystem collapse and climate change. I thought that with 30 years of good science we could address those problems. But I was wrong. The top environmental problems are selfishness, greed and apathy…and to deal with those we need a spiritual and cultural transformation—and we scientists don’t know how to do that. Yes, the problem isn’t that we don’t understand the potential impact of what we’re doing to the environment. What we don’t understand is how to actually get society/societies to do something about it. The Hawkmoth Effect seems straightforward to understand. Say you had a complicated electronic circuit with hundreds of components. You know exactly how it works because it ran through a simulator with the same results. Now you change the value of some component and it works completely differently than expected. This is common for behaviors that are delicately balanced. In climate science, I would suggest that tidal models are somewhat susceptible to the Hawkmoth Effect. There may be hundreds of tidal constituents and if you get one of the principal constituents wrong, especially in terms of frequency (and less critical in terms of amplitude), the answer will be wrong. In geophysics, it would be in calculating eclipses. For technology, GPS calculations would be a good example. None of these examples have anything to do with initial conditions. I didn’t say I don’t understand what’s being described. What I’m getting at is that this doesn’t seem to be something that can be described in some kind of simple way. I have ordered Eric’s book after seeing Willard’s comments. I am writing a book where the so-called butterfly effect is a central part and Hawkmoth may be, but will have to read his book. My book is being written because few people given credence to our thesis that climate change is enhanced climate variability, and that change proceeds through a sequence of steady-state regimes, separated by abrupt shifts. The climate models produce these, so the proposition they don’t reproduce system complexity is a bit misleading. The result is warming that follows a staircase pattern. Complex system behaviour is emergent from the representation of physical processes in the models. This is being discarded as noise because of the over-reliance on trend analysis. Comparing different ensemble members of the same model and ghg pathway shows that the timing of step changes is largely due to initial conditions uncertainty, but that the long-term evolution of temperature change is roughly linear in proportion to forcing. This is because the first law of thermodynamics is roughly linear in this case and the second, how that energy is dissipated in the climate system, is nonlinear. It seems it can be described by Lorenz attractors acting as heat engines. The models represent these as being less complex than they really are, although they get the really big one in the Pacific, the AMO in the Atlantic and some others. This does not discount larger, abrupt shifts that may occur from other feedbacks (e.g., ice-sheet collapse or major ghg release). Hawkmoths here maybe, but I take some confidence in the ability of the models’ ability to produce rapid shifts between climate regimes, though this could be markedly improved. Just out of interest, in your proposed scenario, what process cause the system to spent time in a quasi-steady state despite continually changing forcings? Well, I’ve known about the Hawkmoth Effect for awhile now, and know how important it is for doing GPS calculations, which is what I was doing a few years ago in a professional capacity. Essentially, if you don’t get the ephemeris of the satellites exactly right, you won’t get the right numbers. In the time since, I applied ephemeris data to ENSO calculations, motivated partially by the fact that I had some inside information that NASA JPL were seeing effects of lunar & solar gravitational forcing on climate indices. As with GPS, I found if you get the ephemeris exactly right then you will see the effects in e.g. the ENSO time-series. It also helps to be able to calculate Laplace’s Tidal Equations, which probably exaggerates the Hawkmoth Effect, since that solution is also structurally sensitive to the extreme. The presentation is available at the ESSOAR site. How is that some kind of Effect? That just sounds like putting more physics in and setting your parameters accurately. What exactly is the Hawkmoth Effect that you’re having to consider? @Angech: It’s not surprising that Trump’s Wheeler’s EPA is destroying the environment and has enlisted Christy, sour grapes practitioner extraordinaire, in the process of poisoning us all. Wheeler is a former big coal lobbyist. Fox in charge of henhouse. For example, PFOAs and PFAs. The description of Lorenzian attractors suggests steady-state. Climate is full of oscillating systems, some are non-periodic, others quasi-periodic. 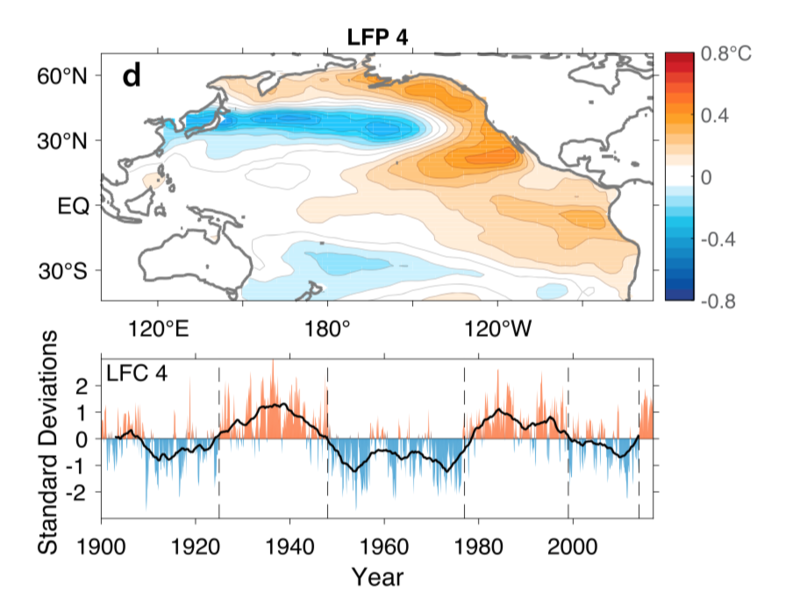 Work on the damping of temperate anomalies in the surface ocean shows they take between roughly 1.5 to 7 months over most of the ocean, with negative feedbacks of 10 to 35 Watts per square metre per degree. Globally, this essentially asserts control over atmospheric temperature; i.e., it is surface controlled. Excess heat is absorbed by the ocean as part of this process. The atmosphere does not have the thermal capacity or conductivity to warm independently of this. The eastern Pacific is in steady-state while it transports heat to the west, the warm pool is the other part of the heat engine. If the amount of energy needing to be transported to the top of the atmosphere and poles exceeds the ability of the system to do sufficient work at its current temperature, the shallow-ocean atmosphere system will shift to a warmer state; i.e., a warmer climate regime. The warm pool is the major source of this heat. This describes how the climate oscillates in both a forced and unforced state. Forcing enhances the existing processes, it does not add a new, independent convective process. The dissipative system cannot distinguish between longwave radiation of anthropogenic or natural origin, it is all a single process. (The current standard theory of gradual warming works on planets without oceans – few people have seriously considered what would happen if you have an active ocean that acts as a heat sink. The limits of this heat sink would not be reached until the planet is somewhere between 25 and 40 C according to modelling that seeks the limits between so-called cool greenhouse with a stratosphere, and when vapour loss from the atmosphere occurs). This sounds like what in mathematics is called a singular limit. The idea that the limit of the solution of the equations is not the same as the solution of the limit of the equations. We know this is the case for fluids with small viscosity. There is a difference between solutions of the equations with small viscosity (the Navier-Stokes equations) and solutions of the equations with truly zero viscosity (the Euler equations). No matter how small, but nonzero, the viscosity is, a finite amount of energy is dissipated in increasingly narrow boundary layers. But if the viscosity is set to zero, then no energy is dissipated. Because we know this, we go to great lengths to parameterize the energy dissipated at unresolved scales in climate, weather, and ocean models. If we didn’t know this, we might naively throw out the dissipation term in the equations because it is so small and we would not get anywhere near the right solution. Like you said, it’s a complement to the Butterfly Effect/chaos. There are many behaviors that are mistaken as chaotic but are complex because they have many constituent factors. Deferring to Lorenz instead of fully exploring the system is the equivalent of punting on first down. Sorry, that was a NYTimes article about Wheeler and the removal of protections from toxic chemicals under Trump’s Wheeler, coal lobbyist, undoing a decades worth of trying to keep our water clean. It did show up when I posted it. There’s plenty more. Christy is not an innocent bystander in promoting big short-term profits over clean air, earth, and water. Europe has banned these things, but here we don’t care how many people are poisoned by known carcinogens and toxic waste from big fossil. no, it isn’t. Far more mathematically talented people than I have tried to do this from a theory first viewpoint. It is too hard and inconclusive. The most sensible way to tackle these questions is conceptually, using a strongly empirical approach (e.g., why are there shifts in warming that align with regime changes?). There are competing theories out there ranging from linear stochastic through to state changes only – they all have proponents and are incommensurate. Some are diagnostic, some deterministic, some a mix. Lorenz used in this sense is descriptive. Hasselmann’s linear stochastic theory assumes the forced response is linear. It has been hybridised with state changes to show that climate could feasibly be both. These are all idealistic models and no one has been able to reproduce the climate system using them. It is too complex for that. On the other hand, the presence of climate regimes can be shown statistically, but need to be better understood dynamically. So on the one hand, we have all these dynamic possibilities and on the other a simple statistical model that assumes change and variability are separate processes, independent of such regimes. The practice of separating signal from noise is a method. The process by which the signal is monotonic requires either gradual in situ warming in the atmosphere and/or gradual release of heat from the ocean. It also requires a concept called ocean heat uptake efficiency. This is a heuristic model developed to understand simple energy balance concepts but has been adopted as a real thing. It isn’t. There is a deep ocean heat uptake efficiency (deep mixing rate), but there is no practical limit to the amount of heat the ocean can take from the atmosphere that isn’t governed by surface energy balance and heat conductivity and capacity. The complex climate models actually do this. To understand which theoretical approaches describe the system best requires analysing data from both obs and complex models. It requires specific questions to be asked. Few people are interested in asking such questions – many more are playing defend the trend. In the past, this was perhaps blissful ignorance but as time goes on, is beginning to look like denial. Paraphrasing Held – somehow, it all goes through the eastern Pacific. The problem, nobody knows what the PDO is. This is a counter-example to the Butterfly Effect. The standing wave result is not at all sensitive to initial conditions but to all the parameters of the system, including the driving frequency. Is it the Hawkmoth Effect? Could be. If you’d like a bit more detail about this than I get into in the book, I recommend taking a look at the paper I wrote with two students on this. The paper went through many many rounds of referee reports, some from philosophers and some from climate scientists, and at least one from a mathematician, and it not only goes into a bit more detail than the book, but also clears up some nuances. One thing that gets a bit more detailed discussion is the difference between the ordinary idea that model error can be worse than initial condition error, and the technical notion of a hawkmoth effect, which is supposed to be worse. Btw: I couldn’t possibly agree more with, or have better said, what you say in the last paragraph of the OP. Roger, Fine with me that you go a route inspired by Lorenz as it’s your dime. In all my experiences, I’ve never observed a stationary standing wave mode that was chaotic, so I will stick to the NASA JPL suggestion. JCH, I am looking at common-mode forcing mechanisms that tie together some of the major ocean indices. This is in contrast to the teleconnection idea favored by others. 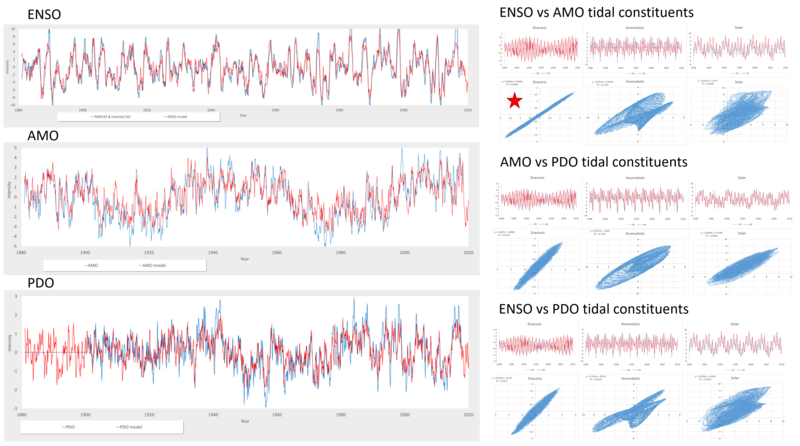 Pure PDO is from Disentangling Global Warming, Multidecadal Variability, and El Niño in Pacific Temperatures When the pure PDO pattern is present (the positive phase is in the illustration,) there seems to be the biggest peaks/valleys in natural variability. Thanks, and thanks for the link to your paper. I read the Appendix of your book, but will have a look at the paper too. That reminds me, Susan. of the time I arranged for a fire safety session to be held at work one lunchtime (I had an HSE role at the time and part of it involved arranging a series of lunchtime talks). The fire safety officer started by asking us to list the three most common causes of fires, write them on Post-It notes and stick them on a board. The usual suspects topped the list: cigarettes, electrical faults, cooking, open fires, camp fires, barbecues, DIY (blowtorches), oil or gas leaks or spills, lightning, accidental lenses like broken bottles. His top three? Men, women and children. I would think the odds of a Hawkmoth effect or some other surprise would increase as different parts of the climate system are pushed farther and farther from equilibrium and at different rates i.e. atmosphere- fast, ocean – slow, ice sheet – very slow. those oscillators influence shifts in climate regimes. Both the PDO and the AMO have affected NH temperature shifts – still working on leads and lags. You are looking at very different phenomena to the ones that I am. I start on temps and work backwards. The shifts in temp coincide with some, though not all, oscillator shifts. The biggest temp shifts are when oscillators combine. This has been detected by multiple studies, but the results have been used to subtract the shifts to create monotonic trends. If the shifts are accepted as signal, the whole story flips on its head. Roger, I agree that the natural variability terms such as ENSO can be compensated out of the global temperature anomaly to reveal the more-or-less monotonic trend of AGW. There is actually some interesting maths to do with ‘chaotic’ standing wave patterns under the name of ‘Quantum chaos’. The idea is that in systems with chaotic classical orbits the wave eigenvalues/eigenmodes become disordered. But that is ‘chaos’ and not ‘complexity’: the systems are simple. There are plenty of chaotic systems where the outcome of interest ‘hops’ in a staircase like way when parameters are slowly varied. I don’t think you need anything fancy to explain why we’ve gone from ups and downs in global temperature to ups with the occasional paws. Surely it’s just the SkS escalator? By coincidence, the dips due to ENSO etc. caused short-term decline at more-or-less the same rate as the long-term trend increase, so they cancelled out. There’s no reason to interpret that in terms of stepwise heating from one stable or metastable state to the next. As I understand it, the detrended statistics of recent “pauses” are consistent with the statistics when there was no background warming. Occam’s Razor says there’s nothing special happening. Why would a jump between states not be faster or slower than existing “oscillatory” effects, or of higher or lower amplitude? The existing “oscillations” would also need to be turned off by the forcing. Fair enough, it could happen, e.g. some models turn off the North Atlantic conveyor as we warm, but w’re piling coincidence on top of coincidence. But we know that some like ENSO are still happening. This from the thesis sounds interesting. Is the non-tangency requirement analogous to having no bifurcations, where path A can split into never-again-to-meet paths B and C? the system satisfies the strong transversality condition, which states that the stable and unstable manifolds must intersect transversely at every point. (I understand this as a sort of non-tangency condition, such that a small perturbation of the stable manifold cannot make it unstable). If the statistics with and without a linearly increasing forcing (or with different forcings) do look the same, that would be pretty good evidence that there are not a whole series of sticky points on the response-versus-forcing curve (or at least they are swamped by noise). Did someone look at this? But anyway, this is just details: since the long-term trends over 30 years or so match well with the predictions, the fluctuations/nonlinear stuff isn’t doing anything very exciting. There are tests for a change in the underlying rate of warming (e.g. the Chow test), the statistical evidence for a pause is not statistically significant. It is surprising how difficult it is for some to acknowledge that fact, even though it doesn’t mean that it shouldn’t be studied or alternate mechanisms (other than Foster and Rahmstof’s ENSO + volcanic forcing). Science and rhetoric are not really compatible (ask Darwin). Yes Profj, its an interesting point. “Inviscid” solutions are quite different from viscous ones because of the absence of the boundary layer (often off by 20% or more in overall forces for example). In any numerical simulation of the Euler equations there is numerical viscosity so that you can in fact get reasonable looking separation bubbles as numerical artifacts. Boundary layers too can exist but are considered sources of spurious entropy. A little known problem is that the Euler equations are singular any time there is a closed streamline because the entropy is arbitrary on that streamline. Nonetheless Euler situations can be useful. But the problem here is really that in many real world flows the viscosity is so small that finite grids can’t resolve it giving rise to turbulence models which are invariably too dissipative and really are only tuned for simple 2D boundary layers. It’s perhaps surprising they work as well as they do for complex 3D flows. And of course in climate models the grids are so course that most of the interesting dynamics (aside from Rossby waves) is unresolved. But your overall point seems very important in this discussion and perhaps the best point anyone here has made. Basically a very small term (7 orders of magnitude smaller than the inertia forcing terms) gives rise to large differences in the overall forces. Fluid dynamics is the long struggle to overcome this problem and as of today the proposed solutions are not very satisfactory. I can’t see much indication in the lSE poster of knowledge of existing theory. The mathematics of structural stability goes back to at least Pontryagin in 1937. Situations in which small perturbations have substantial (but calculable) effect underlies the theory of singular perturbations, of similar antiquity. The fact that non-viscous flow is not the limit of small viscosity has been mentioned. The main factor there is that viscous flow has a non-slip condition, no matter how small the viscosity. That creates an amount of angular momentum which does not tend to zero as the boundary layer thins, and that angular momentum is conserved and shed. That is very like a singular perturbation problem, and there is a lot about it that can be calculated. The statement of the hawkmoth effect sounds a lot like non-uniqueness. But in many cases there are extra factors which choose among the non-unique solutions (for some reason, Tikhonov got his name associated with this). You just have to make sure that they are included in the solution process. The other question is, when should you really care? The effect of chaos in removing dependence on initial conditions is often presented as something bad. But in fluid dynamics as applied, it is essential. Flows cannot be deduced from their initial conditions, and that is a necessary part of numerical and physical studies. You don’t actually know the initial conditions anyway, so if they were important, analysis would fail. Wind tunnel flow over a wing is not steady state, but the initial state of the wind tunnel should not be a factor. I think that structural stability is discussed quite a bit in this context. However, as I understand it, one of the points Eric makes in his paper, and book, is that satisfying structural stability is quite stringent. In many cases, maybe impossible. However, not satisfying this does not imply that some numerical model is structurally chaotic. Just because a simulation doesn’t satisfy this stringent constraint, doesn’t mean that the result will diverge exponentially from the “true” solution. And of course in climate models the grids are so course that most of the interesting dynamics (aside from Rossby waves) is unresolved. There’s an app for that, dpy. It’s called parameterisation. You may have heard of it. We do the same thing in oil and gas simulation modelling, but call it upscaling and pseudoisation. If you try to calculate the upscaled parameter from scratch, you get nonsense or divergent results. Or need a gazillion measurements you can’t make, or a computer the size of Deep Thought. Usually all of the above. Even if you could do so, it would only be for that cell, and interactions with neighbouring cells (flow out of and into the cell) would invalidate the result (some procedures allow for that by upscaling supercells containing ensembles of 9, 25 or 49 target cells* and applying the result to the central cell). So you either apply correction factors, calibrated to multi-cell sector models, or ditch the bottom-up approach and find the top-down parameter, with the same units, that results in the correct dynamic behaviour of the sector model. Following George Box’s advice, of course. If we just gave up and said “oh dear, it’s too complicated and difficult”, oil would cost $1000 per barrel. * Squares because flow is typically in layers; in the atmosphere or ocean, or for vertical permeability in reservoirs, they’d be cubes. Below is a link to one of Isaac Held’s blogs where he discusses a simple atmospheric model with radiation forcing as a function of latitude and rotation and not much else. The blog includes a video of 400 days of model results after the model is spun-up from an initial state of rest. A couple of points: 1) Per the video, It only takes a few model-days to go from rest to a realistic flow with many features of the real atmosphere, 2) Although the flow is chaotic, the average flow has well defined properties that are linear functions of key parameters: rotation rate, drag coefficient, N/S radiation gradient (not discussed). In terms of climate simulation, I’m am not worried as long as we remain close to our historic climate. But if we move far enough away, with transient boundary conditions due to disruption of climate sub-systems like ice sheets, then all bets are off. But if we move far enough away, with transient boundary conditions due to disruption of climate sub-systems like ice sheets, then all bets are off. Nick Stokes has some good insight in regards to singular perturbation analysis. He hints at the vanishingly small perturbation that is involved in the density difference in the thermocline. This needs to be evaluated as an effective gravity difference in the fluid dynamics behavior. It may seem counterintuitive but as long as the fluid interface remains immiscible, the sloshing dynamics increase as this parameter becomes smaller. In other words, one can’t ignore this parameter or set it to zero. This is in contrast to a parameter such as the Coriolis effect, which can be set to zero precisely at the equator. Nic, your point about boundary conditions is a good one. One could run an Euler simulation with a no slip boundary condition. One would probably get something with a thin boundary layer driven by the numerical viscosity. As the grid gets denser that would get thinner. Would there be a limit? Don’t know but I suspect not. The real problem here is that without the heavy sledge hammer dissipation of a turbulence model, Navier-Stokes is very poorly behaved numerically and wants to be unsteady if the grid is fine enough. Actually in wind tunnel testing there are common cases where initial conditions can make a big difference. At high enough alpha there are at least two solutions (and possibly more). One is mostly attached and the other one is massively separated. Which one you get depends on whether the initial condition is attached or massively separated. There is numerical evidence that for complex geometries there may be many of these solutions. This is an area people have generally ignored in the past. They tend to only report the solutions that agree with a given set of data, which often is not extensive enough to fully explore the range of possibilities. I personally believe that multiple solutions are common anytime there is separated flow and in other cases too, such as nearly shock free airfoils. Actually Nic, Do you know what an Euler solution (no numerical viscosity) would look like with a no slip boundary condition? Is it singular? David “I’ve never worked on simulations where the fluid responds to the force of gravity” Young, care to discuss the ocean? Let’s keep this at least reasonably pleasant. DPY seems to be asking genuine questions. Chubbs, in your link to Isaac Held’s blog link they briefly discuss a sudden jump that occurs in the (the Wang, Gerber, and Polvani paper) due to shifting atmospheric dynamics. Though they have to go to 5C change to see this. So maybe the ‘noisyness’ of ENSO and volcanos, and quasi-steady state turbulent fluctuations etc are enough to explain departures from the trend, but there are some hints that there could be step-like shifts as well even without worrying about ice sheets etc. PP, [chill. -W] All fluids on earth respond to the force of gravity. Most fluid dynamicists have done work on incompressible flows and a lot of the most interesting examples of nonlinear behavior are for these flows, e.g., the Taylor column with its bifurcations and subcritical transition to turbulence, which is an example by the way of structural instability. Lets not turn this into a dpy versus PP thread. Might be best if you both mostly ignored what the other is saying, unless you have something particularly constructive to say. ENSO is not noisy, it’s all signal. I actually think this kind of thing has been discussed before in comments on other posts. One classical example of singularity is subcritical transition to turbulence. It’s virtually impossible to model it accurately because its so sensitive. Another example is stall (also known as the drag crisis). There are lots of ways to stall, e.g., gradual or sudden and many spatial patterns of these two. It is starting to appear that initial conditions can determine the exact path you follow. There are lots of nonlinear bifurcations and instabilities in fluid dynamics. They are perhaps not very well known to the public because vehicles are carefully designed to avoid them. That’s based on a huge investment and centuries of practical experience with plenty of failures along the way. > I actually think this kind of thing has been discussed before in comments on other posts. What is interesting is that, like in Frigg et al. (2014), they report in this paper that for this different perturbation, at [epsilon] = .1, the maximum one-step error (relative to the standard logistic equation) is .005. But this is wrong. The small change in the equation makes the maximum one step error skyrocket to .04, for the same value of [epsilon]. We can think of no better anecdotal demonstration of how artificial the maximum one-step error is as a metric of model distance than the fact that the authors took themselves to be presenting the same perturbation twice, and it happened to differ on that metric by a factor of 10. Paul, maybe you could try re-reading my comment where I suggested that you and dpy simply ignore each other? Yes the Wang, Gerber, and Polvani paper that Held references (link below) uses a simple atmospheric model and finds a sudden circulation shift if the tropical upper troposphere (hot spot) is warmed enough. So, no need to invoke ice sheets for a sudden circulation change. Climate models have great difficulty in matching the equitable climate of the pliocene. In those simulations boundary conditions are held fixed at Pliocene conditions. Modeling the transition to the Pliocene, with unstable and uncertain boundary conditions, would be much more challenging and is not even on the climate model radar screen. It looks like an interesting paper Willard and I will read it. However, there is a mountain of evidence that this instability is present in many common situations. I don’t know much about “simple” systems as the literature is sparse. 1. We have plenty of evidence from well known fluid dynamics of structural instability. You can find plenty on the Taylor column where Sweeney did some great work on transition perhaps 35 years ago. Subcritical transition is well known to be not really predictable with any method really. I mentioned above the stall and its apparently many multiple break down patterns. I do wonder if Eric is aware of the corpus of fluid dynamics science. 3. In climate models this structural instability is quite obvious based on first principles analysis of truncation errors. I think I’ve given you this link before where it is clearly demonstrated. In fluid dynamics models that aren’t in some sense independent of numerical details are discarded because its impossible to tune and validate them. Climate models seem to be where turbulence modeling was in the 1960’s. Exactly how common are these situation? The rule to bear in mind is that there is a positive bias in the modeling literature and most of the failure do not get reported. I know that from first hand experience. > I know that from first hand experience. Why would you think it’ll work this time? Indeed, in the field of meteorology, it is well accepted that the dominant error growth in weather forecasts is structural. If this were not the case, weather forecasts would not be getting better over time as fast as they are. It is not just that the degree of model error we actually have destroys forecast skill faster than classical chaos, according to them, it is that arbitrarily small model structural errors are as dangerous as small errors in initial conditions are in the presence of classical chaos. It is this alleged tight analogy that leads them to refer to absence of structural stability with a term, “hawkmoth effect,” that is a close cousin of the term “butterflyeffect”. In the presence of uncertain model structure, according to them, therefore, the phenomenon, which is “generic” in non-linear models, renders mathematical models useless for quantitative prediction. There’s a world of difference between observing that predicting is hard (especially the future) and claiming that predicting is impossible when things get chaotically tough. You are literally my favorite person this week. It’s really wonderful to be so well understood and summarized!!!!!!! > It’s really wonderful to be so well understood and summarized!!!!!!! I do wonder if you are aware the corpus of fluid dynamics science is a subset of thermodynamics. Unless you are claiming that fluid turbulence can create energy, then it is describing how, over what area, and timescale, the energy will be dissipated in a fluid. Obviously it is important to know if, where and when a hurricane or typhoon is going to strike a populated coast. And that probably is subject to limits of prediction because of the complexities of fluid dynamics. But the elephant trying to get out the door is the increased thermal energy that is available to drive the fluid dynamic heat engine that is a tropical storm. You have posted with a patina of authority on the subject of fluid dynamics and may have made a case for it having a role in limits to prediction at the time and distance scales over which it operates. But have failed to make even a partial case for your ide’e fixe having any significant impact on the underlying thermodynamics of AGW. It’s amazing what you can discover when you actually go and measure stuff rather than just hand-waving. Why, it’s almost as if the folks making the modulz know that they’re doing! I’m wondering with the structural stability stuff whether what is intended is mostly sensitive dependence on numerical parameters (for example, with the logistic map, the late-time statistics are quite sensitive to the parameter if you start in the right place) or that ‘adding some other term’ might change things dramatically. At least the parameter dependence of the climate models of interest doesn’t look particularly alarming. And can be understood at least in principle by scanning their values. Sometimes you get surprisingly large effects if there is some symmetry or degeneracy left in the model that gets broken by a small perturbation but that seems a bit of a stretch for the climate models. They already have a huge set of complications thrown in. What the Wang, Gerber and Polvani paper is highlighting is a change in the attractor due to a change in forcing/boundary conditions. There are a few key parameters that determine global circulation: rotation rate of the earth and pole/equator temperature gradient being the most important. Hothouse circulation, without ice at the poles, is could be much different than current, and the shift may not be gradual. Could see a large re-ordering of temperature/precipitation patterns. Note that the simple model in the Held blog is spun up from rest. Climate models can also be started this way. That indicates that the forcing drives the solution. Where climate models fall down is 1) clouds, so the rate of change is uncertain; and 2) key boundaries like ice sheets, so the final state is also uncertain. ECS could be much different than projected by current climate models in a future world with significantly reduced cryosphere and a different circulation pattern. So concern about climate models is justified, but generally misplaced. ECS could be much different than projected by current climate models in a future world with significantly reduced cryosphere and a different circulation pattern. So concern about climate models is justified, but generally misplaced. Indeed, but this is why we try to distinguish between the response to fast feedbacks only (which is included in climate models) and slow feedbacks (which typically aren’t). So, the ECS is the equilibrium response including only fast feedbacks, while the ESS is the response when slow feedbacks are also included. We have to realize the chasm between the detailed GCMs and the rather toy-like models such as Cane-Zebiak being used to try to unravel the behavior of natural variability. This is seen most clearly in intermediate models like the Cane-Zebiak model that tend to be in a more non-linear regime of phase space than most global coupled models. Whether that is right is a different question. The structure of these two models do not mix. Even more problematic than the Hawkmoth Effect, the formulation of these models lack a structural stability as a starting point. Ben, See the reference I gave about ordering of sub grid models. That’s the textbook definition of structural stability. Eric, Your paper seems to deal with simple problems and mathematical theory. What do you think about the examples from fluid dynamics I gave above? David Hodge, There is no contradiction if you go beyond the superficial. Weather modeling has fundamental limits. It has gotten better over time due to better computing particularly the ability to run large ensembles to assess uncertainty. 10 day forecasts are available from some providers. They are not very reliable. There are many scenarios where outcomes are very sensitive to initial conditions. There are other scenarios where that is not the case and uncertainty is much lower. Izen, I’m not sure I understand your point. It’s little more than a bumper sticker with no detail. Has anybody written a paper on the skill of NCEP 10-day forecast for the GMST anomaly, because to me appears to be quite good. It’s not clear that your examples are really related to the issue. The Hawkmoth Effect suggests that there are structural issues with non-linear dynamical models that imply that solutions can diverge from the truth in a way that potentially makes them unreliable. This is not really the same as the solution you get depending on how you set up the problem. It’s clear that one should understand the limitations of whatever numerical scheme one is using. That, however, is not the same as non-linear, dynamical schemes suffering from a Hawkmoth Effect. > That’s the textbook definition of structural stability. There are a few different definitions of structural stability that we can find in the literature. One good survey can be found in Pugh and Peixoto (2008). The first thing we should notice is that they are definitions of ways of guaranteeing two trajectories to stay arbitrarily close. And failure to stay arbitrarily close is not the same thing as being guaranteed to go an arbitrary (bounded) distance away. But in analogizing absence of structural stability to SDIC, the LSE group are engaging in exactly this conflation. [Teh Koonin] That’s fine. We are not experts. [IsaacH] in the sense that they don’t conform to my picture of how the climate system works. So, I have my null hypotheses. And I have been doing this for over 30 years, so I have developed a lot of hypotheses. Some of them turn out to be wrong. I don’t like this argument from complexity saying oh, it’s a chaotic system. There is all sorts — you can get a nonlinear system to do anything you want. That just doesn’t tell me anything. But whenever I look at the forced response of the climate system, it looks linear to me. And what is the best example we have of forced responses? The seasonal cycle. Seasonal cycles are remarkably linear-looking. The lack of predictability of the very next state within some epsilon may not imply we can’t predict anything in a longer run. Prediction is usually coarser than that. We may not be able to predict the exact moment when seasons naturally come and go (it’s a convention more than anything), but we can be quite confident in saying that winter will disappear at the end of March in our hemisphere. That confidence may increase because I’m Canadian. Or it may decrease. Eh. [*] Michael Brown (pers. comm.) was surprised about that estimate. He felt it was a little short. The reference offered by Wikipedians being expensive, I could not check. What I’m doing is creating a structurally stable skeleton in formulating the behavioral models. I start from the essential Navier-Stokes equations and insert the non-linear forcings and feedbacks (ala the Cane-Zebiak delayed action) and then match the behavior observed. This is perhaps the best way to adapt the structure of the GCMs with what climate scientists believe is causing the natural variability. The aspect everyone seems to be forgetting is that these trajectories do align with an annual synchronization, which is at odds with a chaotic mechanism. dpy: the ordering stuff seems not that exciting… there are many ways of writing bad models but most of these orderings seem to be bad in ways that are easy to spot. Writing a good model requires some playing around and thoughtfulness unless you have a very simple problem. Chubbs: I guess what I’m wondering is whether smaller-scale reorderings of circulation than global can lead to smaller-scale shifts in climate state. So is the response smooth until you get to a major transition, or is it a bit bumpy along the way? Do things like jet-streams shifting position lead to small shifts in climate, say by a few tenths of a degree? Where are the literature examples of “structural instability” such as: ensembles drifting apart, nonlinear response to forcing changes, ensemble variability different than natural, etc. Instead we see a very well-ordered response: slightly higher forcing produces slightly higher global temperature. Even dpy’s reference shows a very repeatable response to re-ordering of the sub-grid processes. The atmosphere is forced by the sun following a with a seasonal cycle and connected to a large heat sink. Currently on average 0.8 W/m2 is accumulating in the ocean, second after second, day after day, year after year, decade after decade. Roughly 1 x 10E22 calories per year. Lets see some back-of-the-envelop calculations showing “truncation errors” or “structural instability” in atmospheric fluid flow moving the climate needle. Till then color me skeptical. Of course an ensemble of Argon atoms will show no sustained coherence — that’s well known from statistical mechanics. I know I’m in the minority here, but we’re talking about something completely different with the topologicially constrained behavior of fluids along the equator. The condensed-matter physicists Delplace and Marston have demonstrated how a ensemble of fluid behave much like ensembles of electrons/holes in a topological insulator. They’re showing that the stability of these systems is not going to dosorder or chaos but to more order (however disguised that is by erratic behavior). This is the inverse energy cascade. I’m going with the physics I can relate to. It’s the inference that follows that matters here, Web. There’s a big difference between going with the physics one has and peddling a pet topic without showing you’ve done any kind of due diligence to the post under which you comment or the point to which you respond. Willard and ATTP, This statement from Eric’s paper seems unquestionably correct with regard to CFD and fluid dynamics generally (including atmospheric and ocean modeling). However, the paper does nothing to rescue climate models because at their current state of underdevelopment they are well documented to be structurally unstable as this paper shows. The problem here is that gaining confidence in CFD modeling of even simple attached flows has taken a century of work by many thousands of people and a massive increase in computing power. Climate models with their algebraic sub grid models and very coarse grids are where CFD was in the 1950’s. No Dave, You missed the point entirely. There is no “correct” order because in nature they are all “solved” simultaneously. Ordering them is an arbitrary numerical choice that is an artifact. Everyone knows that the best way is to solve them simultaneously. Eric’s paper is not about rescuing climate models. You should probably try reading Eric’s paper in more detail. Structural stability is a very strong constraint. That a numerical simulation doesn’t satisfy structural stability does not mean that it is structurally chaotic (i.e., it doesn’t mean that a lack of formal structural stability implies that the numerical results will diverge exponentially from the “true” solution). For example, we already know that climate models probably do not get the “true” average absolute global temperature, However, given that we don’t expect the response to some perturbation to depend strongly on the absolute temperature, this does not mean that we can’t use climate models to investigate how our climate will respond to radiative perturbations. > they are well documented to be structurally unstable as this paper shows. Because weather and climate models must capture a wide variety of spatial and temporal scales, they rely heavily on parameterizations of subgrid‐scale processes. The goal of this study is to demonstrate that the assumptions used to couple these parameterizations have an important effect on the climate of version 0 of the Energy Exascale Earth System Model (E3SM) General Circulation Model (GCM), a close relative of version 1 of the Community Earth System Model (CESM1). Like most GCMs, parameterizations in E3SM are sequentially split in the sense that parameterizations are called one after another with each subsequent process feeling the effect of the preceding processes. This coupling strategy is noncommutative in the sense that the order in which processes are called impacts the solution. By examining a suite of 24 simulations with deep convection, shallow convection, macrophysics/microphysics, and radiation parameterizations reordered, process order is shown to have a big impact on predicted climate. In particular, reordering of processes induces differences in net climate feedback that are as big as the intermodel spread in phase 5 of the Coupled Model Intercomparison Project. One reason why process ordering has such a large impact is that the effect of each process is influenced by the processes preceding it. Where output is written is therefore an important control on apparent model behavior. Application of k‐means clustering demonstrates that the positioning of macro/microphysics and shallow convection plays a critical role on the model solution. Do you really expect compositionality of process implementation? Some due diligence right there. Well Yes Willard, this is a first principle of sub grid models that is well established in fluid dynamics. The real world advances all these processes simultaneously. When the time step is large, doing the processes sequentially is an arbitrary choice. If you tune each model based on real world data, then you should solve the models simultaneously to have any chance of doing real validation and mimicking nature. This is really a very well understood principle of turbulence modeling for example. The model must be solved simultaneously with the Navier-Stokes equations. Well ATTP, any model can be used to “explore” how the system might respond. That’s a very low standard. One would hope for quantitative results that are meaningful. One certainly can’t use models as real evidence for ECS as that can be engineered over a pretty broad range with either the cloud microphysics model or the order of sub grid processes. I guess my question is why such an obvious conclusion is so much resisted by both scientists and communicators given the very strong evidence from several fields of computational science. And how much of climate science is reliant on these models for its conclusions? > this is a first principle of sub grid models that is well established in fluid dynamics. As opposed to what kind of choices, DavidY, and how many strictly parallel computers are you using at Boeing to run your tests? It’s getting boering, quite honestly. Except the claim being made is essentially that these structural instability implies that results can diverge substantially. There is little evidence to support this. There is a difference between the result not matching “truth” to satisfy some stringent stability requirement and the model results diverging exponentially from this “truth”. If you want climate models to exactly match reality (which is what you seem to want) then they will probably never achieve that. If you want to understand how our climate respond to radiative perturbations (on suitable timescales and lengthscales) then they probably can. All models are wrong. Some are useful. If you think ECS can be engineered over a broad range, why hasn’t a skeptic published a result from a climate model that suggests an ECS of less than 2K? Willard, You solve the models simultaneously by sequential under relaxation if needed. Or you can just code up the Jacobians and use Newton’s method. They are small systems for algebraic models so computer time is not an issue. I don’t know why you keep responding in such a trivial and nontechnical to these points. > why hasn’t a skeptic published a result from a climate model that suggests an ECS of less than 2K? That’s when one starts to appreciate Eric’s point about robustness analysis. Getting luckwarm results should be fairly trivial with model tuning. OK ATTP, I think we an leave it at that. I do thank you for posting on this as it has improved my understanding of an important issue. One powerful aspect of climate science is the broad and deep hierarchy of climate models. From simple energy balance models that you can solve with high-school algebra to state-of-the-art kitchen-sink earth system models. People have mentioned various points in the hierarchy such as Isaac Held’s “fruit-fly” model and the Cane-Zebiak ENSO model. Further, each level of the hierarchy consists of a collection of models. They differ in detail but have similarities in terms of which processes are included and which are parameterized. The overall model hierarchy gives us a picture of where structural instability lies. We know what it takes to get many aspects of the climate system right. Mid-latitude Jet Stream behavior is captured well by models in a large region of the model hierarchy parameter space. The same is true for the seasonal cycle. We have insight into the boundary of these regions and how mucking with the physics of a model can push a model outside these regions. We also know where the hierarchy struggles. We know that complex climate models don’t capture the Madden-Julien Oscillation (MJO), they differ in the structure of their Intertropical Convergence Zone (ITCZ), they differ in precipitation. These aspects of the climate show complicated and poorly understood sensitivity to model choices. In the end, the model hierarchy provides a useful map of sensitivities in some conceptual parameter space, although certain regions might be labeled “Here be dragons”. So far there is no sign of a catastrophic Hawkmouth effect, where sensitivities in one part of the climate system cascade into other parts of the climate system, rendering the whole model useless. Models have useful seasons and midlatitude Jet Streams despite having useless ITCZs and MJOs. > computer time is not an issue. You can’t even keep up with your own points. Indeed, we don’t simply run climate models and assume that the results have validity. There is a lot of other information, and a great of additional understanding of the climate, that means that we can have confidence in some aspects of what models produce, while recognising that there are also limitations. Imagine two physicists interested in studying the interaction of a pair of fluids at supersonic speeds. Each of them uses sophisticated technological artifacts to generate images of the flow structures that are generated as a shock wave propagates through a fluid. Each of them manipulates the equipment so as to be able to investigate their phenomenon of interest at a variety of values of basic parameters—different relative speeds, different densities of fluid, different geometrical configurations, different boundary conditions, etc. And each of them analyzes the data and images they generate in order to try to discern fundamental patterns, scaling relations, and other features of interest in the flow. The first physicist’s equipment is a laboratory setup consisting of a tank of fluid containing simple spherical and cylindrical shapes, bubbles of gas, and a physical mechanism for causing a shock wave to propagate through the tank. The second physicist’s only piece of equipment is a digital computer. Using models from the theory of fluid dynamics as a rough starting point, the second physicist builds an algorithm suitable for “simulating” the relevant class of flow problems, and transforms that algorithm into a computer program that runs on her computer. The computer outputs data, including perhaps graphical output depicting flow patterns. Is there a fundamental difference—a difference of kind—between these two activities? And if so, how should we characterize it? How can we make precise what distinguishes activities of the first kind, the traditional kind of activity that we call “experiment,” from activities of the second kind, what we usually call “simulation.” And are there, in particular, fundamental respects in which the nature of the epistemological relationship between the artifact and nature—that is to say regarding our abilities to use the artifact to learn about nature—differ in the two cases? We cannot create twin-Earth experiments for now. We can’t afford to wait until we can either. All we got are stoopid computer modulz. Running GCM simulations will remain quite expensive and time-consuming for a while. Every modeller I know admit they have limitations. But that’s what we have, and they’re robust enough to help us improve our understanding. They probably can’t satisfy predictibility in any deterministic sense. But predictions don’t need to be deterministic. Climate scientists are not shooting for a pixel-perfect image of what will happen on February 3rd in 2047. They only want to have a rough ballpark of where we’re heading, based on how well they can hindcast the data we have. Pixel perfection is the enemy of good modelling. How fortunate that the flow of money within an economic model can be calculated without having to worry that chaotic turbulence at the surface interface between large asset streams and local sinks and sources, will not dissipate wealth in unpredictable ways that would invalidate them as useful tools in policy decisions. I understand economeretricians take great care to avoid structural instability by ensuring their mathematical modelling conforms with a constrained form or class of algorithmic methods. This may be at the expense of predictive skill. Sorry about the late response – events. Actually, I did that once, here and here. You have to do something about the angular momentum, or vorticity. There we did have periodic vortex shedding, and so I modelled the vortex growth, controlled by a Kutta condition. Later we used a discrete vortex method, which allowed more degrees of freedom, but functionally the solution was the same. The 2nd objection of yours has already been covered in a previous (and off topic recent) discussion here. So called, model “tuning” is still bound by observational constraints unless one is directly accusing the numerical modelers of nefarious intention, as would appear to be the case, for one individual herein. “In spite of our attention to the Cess sensitivity, our first coupled simulations with prototypes of AM4.0 still generated large values of TCR, often greater than 2K and still substantially higher than CM2.1’s value of 1.5–1.6K. The assumption of proportionality between TCR and Cess sensitivity would have predicted a lower value, closer to 1.6–1.8K, taking into account the increased CO2 forcing due to changes in the radiation module discussed in section 3. While analysis of this behavior is still underway, we believe that this difference is in large part due to the stronger polar amplification in coupled models incorporating AM4.0 than in CM2.1, which has unusually low polar amplification. The polar amplified warming combined with relatively weak negative low cloud feedback over the midlatitude and subpolar oceans evidently produces a larger ratio of TCR to Cess sensitivity in AM4.0-based coupled models. “2. Early preliminary coupled simulations suggested that our TCR was still relatively high, 2K or even higher, more comparable to AM3 than AM2, despite a lower Cess sensitivity. This result, still not understood fully but presumably related to strong polar amplification, has encouraged us to continue thinking about alternatives for lowering the sensitivity. So, in this iteration of GFDL modeling at least, “engineering” or “tuning” of their fully coupled model does not appear to be as easy as some might think (e. g. Zhao et. al. 2016 and someone here in this thread). Do you have any thoughts on sustaining anti-vortices, especially along the equator? There is one point on which I think Eric’s paper is not quite right. Section 5 is a lengthy discussion of the daemon example involving the logistic equation. The example “close” model change is multiplied by epsilon but involves a cubic term whereas the original model has quadratic and linear terms only. Eric dismisses the importance of this example because he says one needs to show that this type of thing comes up in actual atmospheric models. Well, it does come up. Turbulence models are highly nonlinear and this sort of change is exactly what turbulence modelers do. I’m not sure if turbulence models are structurally unstable by Eric’s definition, but they can exhibit the kind of large changes in final state exhibited by the daemon example. You don’t even need a change of model functional form. Just adjusting the constants can make a large change near stall for example. I’m not sure if turbulence models are structurally unstable by Eric’s definition, but they can exhibit the kind of large changes in final state exhibited by the daemon example. You really need to do better than simply wave your hands wildly. In what sense do they exhibit the kind of large changes in the final state exhibited by the daemon model? Our climate is largley bound by energy balance. There is a vast difference between the precise final state depending on some structural choices in the model and these allowing for an exponential divergence of the average final state. @DPY6629: I think you might have missed the main point we were trying to make about the demon example: we spend a great deal of time showing that the perturbation of the logistic equation is not “close” to the original equation. I think we give some rigorous arguments but I also think the footnote that Willard cited is excellent anecdotal evidence that their metric of “closeness” is bogus. It’s known from condensed matter physics that vortices cannot form directly along the equator. The vortex-free zone is known as a Meissner belt in superconducting spherical shells. No vortices, no turbulence. > Eric dismisses the importance of this example because he says one needs to show that this type of thing comes up in actual atmospheric models. Definition 6 If X is the set of smooth vector fields on a manifold M equipped with the C^1 topology, then the flow generated by x ∈ X is structurally stable if and only if for each y in the neighborhood of x in X there is a homeomorphism h : M → M that sends the orbits of x to the orbits of y while preserving the orientation of the orbits. 1. The map has to be differentiable. 2. The map has to be a bijection […]. 3. The inverse of the map has to be differentiable. The obvious problem is that the logistic map is not a bijection! Every number other than 1 has two preimages. For example, both .3 and .7 map to .84. So .84 has no unique preimage and there is no function that is the inverse of Eq. 4. But this means that the logistic map isn’t even the right category of object to be structurally stable or not. Eric and his co-authors then go on to show that if you extend your definition to maps in general, then not many maps are structurally stable. Note 20 is also interesting, insofar as it shows how to simplify a climate model to its simplest mathematical expression. I guess by anti-vortices you mean contrary motion induced by a vortex. This is necessarily a viscous effect. Vortices represent angular momentum, which is created by torque. Shear with viscosity means that rotating fluid can exert some torque on nearby fluid. These patterns arise where something creates differential torque but no net torque. For example, a body in a wind tunnel spins fluid one way on top, and the other way under, shedding an alternating vortex street. At the equator, these alternate vorticities come from Coriolis effects, which create angular momentum which is carried by the currents converging on the equator. Nick, I think those are currently referred to as tropical instability waves in the literature. On the equator, it is a moving standing wave (or traveling wave), but off the equator the vortices appear as the Coriolis effect kicks in. The behavior is ordered as the wavelength is always 1100 km. This is likely part of the ENSO behavior, with the tropical instability waves a higher wavenumber feature of the larger standing wave mechanism. Well Eric, defining closeness is of course the key to making these statements. The logistical equation change is very analogous to the addition of small viscous terms to the Euler equations. In this case you are adding second derivative terms to a mostly first order system. Most people would say the viscous terms are “small.” Turbulence models can exhibit structural instability and that’s why those who develop good ones are well paid. There is a delicate balance between generation and destruction of turbulence so small changes can make a big difference at the downstream end. But the key point here you actually made very well in your paper. Structural instability must be determined on a case by case basis. There are wings for which the viscous terms make very little difference and ones for which the change in forces is very large. The difference is in the dynamics itself and can only be predicted by getting those dynamics resolved. There are lots of interesting examples of structural instability (which usually coincides with sensitive dependence on initial conditions) in fluid dynamics. Transition to turbulence is a famous one where predictive models are weak. You can find some interesting testing by looking for Sweeney + Taylor column in the early 1980’s. Another one is stall and its inception. Often there are multiple solutions near this point. We don’t really have much of a handle on this one yet. Modeling is just too immature and numerical methods poor for the kind of stability analyses that are needed. And that’s generally a big problem. Positive biases are so strong many have come to believe that CFD is a solved problem. There is no interest in putting more robust methods into existing codes. The pressure is to add “more physics” or as the case often is pseudo-physics. Large eddy simulation is the latest example. ATTP, Flow over a wing is constrained by energy balance. But the details matter a lot and those are the dynamics of the system. For climate modeling pole to equator temperature gradient matters a lot for example. It’s determined by dynamics not energy balance. And this is where climate models are weak. Have you looked at the abstracts of the papers I cited earlier. I wonder if Eric can comment on the order of application of sub grid models paper. That seems to me a classical example of structural instability. Those products are all 100% energy based. Ya just got to hate the ignorance of someone here. You can, of course, use the Boussinesq approximation (water waves) or RANS for either 3D or 2D determination of phase resolved waves at local scales (say at a port or harbor). “and this is where climate models are weak” – False, the general circulation (dynamics) is a strength not a weakness in climate models. Below is some text and a link to an Isaac Held blog. Note that the small-scale flows like pipes and wings are not particularly relevant to the atmosphere. “If you accept this then I think you will agree that the quality seen in the free-running model (with prescribed SSTs) is impressive (which does not mean that some biases are not significant, for regional climates especially). This quality is worth keeping in mind when reading a claim that atmospheric models as currently formulated are missing some fundamentally important mechanism or that the numerical algorithms being used are woefully inadequate. ATTP, Flow over a wing is constrained by energy balance. But the details matter a lot and those are the dynamics of the system. Yes, but there is a difference between the details mattering, and these codes fundamentally suffering from structural chaos. In other words, there is little to indicate that a fundamental property of these dynamical simulations is that some structural property of the codes means that the solutions will diverge exponentially and that there is little that can be done about this. But the dynamics are determined by the energy balance. The problem with claiming that the devil is in the details is that may indicate the GCMs are ineffective at revealing the full range of impacts. Boundary conditions constrain the possible states that the climate may reach. But devilish dynamics could vastly increase the possible range of end states. As the changed states are more likely to be negative than positive, so any error correction that expands the possible outcomes in modelling indicates that things are WORSE than we think. Yes, you’ve reminded me that some of the discussion in Erica Thompson’s thesis was about potential tipping points, or unexpected outcomes. I think this is a real issue, and we shouldn’t forget this. However, this is – in my view, at least – distinct from non-linear, dynamical simulations fundamentally suffering from some kind of structural chaos. Part III appears before (2015-10-17) Parts I&II (2015-11-23 for both). Purported Part III is simply titled “‘Making Climate Decisions” and Parts I, II and purported Part III do not even reference each other in their respective citations section. Post hoc BS. Erica Thompson’s PhD is actually a physics PhD and includes quite a large section about the modelling of North Atlantic storms. Just to follow up on the issue about the “soft sciences” (to use EFS’s words) challenging the “hard sciences”, I actually think it’s mostly a good thing. I think all the research areas should be willing to be challenged. What I find frustrating is when people throw out challenges, but then won’t defend them when challenged in return. I think people should be willing to defend their research, especially when they’re making strong claims about fields outside their main field of expertise. “In statistics, hypotheses suggested by a given dataset, when tested with the same dataset that suggested them, are likely to be accepted even when they are not true. This is because circular reasoning (double dipping) would be involved: something seems true in the limited data set, therefore we hypothesize that it is true in general, therefore we (wrongly) test it on the same limited data set, which seems to confirm that it is true. Generating hypotheses based on data already observed, in the absence of testing them on new data, is referred to as post hoc theorizing (from Latin post hoc, “after this”). The AOGCM’s/ESM’s are nowhere near ready for prime time with respect to accurate forecasting or projections of regional outcomes. That this is true does not suddenly imply a ‘so called’ “Hawkmoth Effect”. Our people have been doing this type of work (modeling of extratropical and tropical storms in the North Atlantic) since the late 1960’s on supercomputers from the get go. We are the default SME’s in this area of research. It is part of our effin’ mission statement. Bye. Of course, I agree. I’m just suggesting that researchers should be open to challenges. What this shows is that we should think very carefully before declaring that all the relevant physical effects have been included and that therefore the model is “good enough” to make policy-relevant projections. I think the examples Thompson gives tells us what she means by “policy-relevant projections”. North Atlantic storms, ice-sheet dynamics, potential tipping-points. Not “are models wrong when they predict warming due to us injecting CO2 into the atmosphere”. Why? Because the second question is dominated by the energy and mass conservation laws ATTP referred to in the OP. Her small (regional) scale examples do not have energy or mass conservation – heat and materials move in and out of the sphere of interest. Since aircraft analogies seem to be all the rage, I would categorise the claim that climate models are useless because of the Hawkmoth effect, alongside claiming that 787s can’t fly because we can’t predict the size. location and velocity of every individual turbulent eddy above the wing. On a larger scale, perhaps we can’t be certain that the North Atlantic conveyor won’t shut down and Scotland won’t experience 2C cooling when the rest of world averages 2C warming. Well, duh! So climate models can’t predict which hurricane will hit which Carolinas town when. Well, double-duh! BTW her PhD was at Imperial College, supervised by a meteorologist/climatologist, an economist and an engineer, and she was examined and guided by, among others, Joanna Haigh. So I wouldn’t dismiss her because she spent time at the LSE. She was presumably focused at least in part on local changes and adaptations and impacts, but she had plenty of high-powered help available to keep her on the right track modelling-wise. We all should suspect that there is something missing from the GCM models when the dominant natural variability in temperature is thought to be better captured by models such as Cane-Zebiak and other delayed-action models. The general mechanism needed to be captured in a GCM is the feedback from the last year’s build-up in temperature to the current year’s response. The current GCMs just cannot handle this behavior, which is why there is so much research on this class of delayed-differential models, or even more “out there” in the topological insulator domain and applying those ideas to variability. Aye, and there’s the rub. This may be describing the inverse cascade of energy that flows from small scales to large scales that is now thought to feed into the quasi-periodic behaviors in natural variability. Nick Stokes provided an example of the periodic vortex street known as the Tropical Wave Instability. The fact that a structure with a 1200 kilometer spatial wavelength can run nearly all the way across the equatorial Pacific points to the fact that these large scale behaviors can self-organize via some sort of inverse cascade. This is way beyond turbulence at the small scale, which is really getting in the weeds. The reliability of climate models depends on the prediction. Some things like strong water vapor feedback are so consistent in modeling and strongly linked to physics to be a given. The near-term trend in temperature is another that is probably in reasonable shape due to solid track record in observation and modeling. Cloud feedback and ECS are both uncertain but reasonably well constrained for our current climate. Cloud feedback and ECS could be quite different however in a future climate with different boundary conditions, global circulation and cloud distribution. On-the-other hand many regional effects like north Atlantic storminess are more uncertain even in the near term in a changing climate and could offer some surprises. You’re in no position to confer anything personally right now, Everett – you’re just a pseudonym on a computer screen. Even if you were, you’d have to reconsider that in our actual case it’s the philosopher of science that has called Sokal on the hard sciences. It’d be hard to see Lenny Smith as a soft scientist. Mistakes happen. Overstatements too. Let’s focus on getting something constructive out of this. > So far it isn’t looking too good. Reviewer 2s, billions upon billions of reviewer 2s. Captcha: click on all the squares that are not a pipe. If you want a neat example of turbulence in atmospheric physics leading to organisation on large scales, the bands of Jupiter are hard to beat. Worth noting that some of the leading lights in climate modelling got into it by starting with other planets. I couldn’t agree more, however I would add the condition that the challenger does their homework first as challenging another field is a great way of exposing your Dunning-Kruger. This applies equally to “hard sciences” criticism of “soft sciences” which are generally just as hard (in the other sense) but in different ways. Sometimes this is not possible, e.g. climate modelling for those without a time machine, so the best you can do is archive your predictions/projections so they can be tested in hindsight. From a statistical point of view, if you don’t have statistically pure test data, then there are alternative (not as good) approaches, such as limiting the complexity of the model (Occam’s razor), which includes the number of degrees of researcher freedom required to generate the model. It is often the researcher degrees of freedom that causes the problem as it is often not easily quantified. I forgot to add that archiving predictions/projections so they can be tested later is one of the things that the CMIP projects achieve. Chubbs, I meant of course (as I’ve said many times here) that models are weak on dynamics for things like convection, clouds, etc. You are awfully uncharitable in your selective interpretations. Held is right that Rossby waves are pretty well modeled. That’s why weather modeling works as well as it does. But my explanation is different than Held’s. The pressure gradients in Rossby waves are generally very mild so turbulence model details don’t make a big difference say in the planetary boundary layer. There is a potential issue in that free air turbulence is large in many cases. That’s unmodeled and will make a difference. Thus the rate of decay of Rossby waves is determined by numerical dissipation, not real dissipation. I have noticed that in weather forecasts that pressure gradients seem to get lower with time. I would be interested to see what Held would say about that. Perhaps I’m wrong. “You might think the ideal climate model would mimic the real world perfectly. It would still have discrete grid cells and time steps, but it would be like a digital photo, where the pixels are so small that it looks continuous even when you zoom in. It would contain every single Earth system process known to science, and would represent their connections and interactions perfectly. Such a model would also be a nightmare to use and develop. It would run slower than real time, making predictions of the future useless. The code would not be encapsulated, so organizing teams of programmers to work on certain aspects of the model would be nearly impossible. It would use more memory than computer hardware offers us – despite the speed of computers these days, they’re still too slow for many scientific models! “If you want a neat example of turbulence in atmospheric physics leading to organisation on large scales, the bands of Jupiter are hard to beat. > I meant of course (as I’ve said many times here) that models are weak on dynamics for things like convection, clouds, etc. Backtracking to “weak” won’t do unless you define what you mean by that, DavidY. I certainly would agree that you’ve said it “many times here.” In fact that’s the main thing you’ve been peddling in just about every single thread I’ve seen you over your ClimateBall years. Turbulence models can exhibit structural instability and that’s why those who develop good ones are well paid. There is a delicate balance between generation and destruction of turbulence so small changes can make a big difference at the downstream end. The same extends to climate modelling, it seems to me, except perhaps that those who work on climate are less well paid than those who work for weapon sellers. Both types of models are bound by SDIC, and SDIC isn’t the hawkmoth effect. Returning to SDIC issues won’t cover for your earlier fumble about the hawkmoth effect. Have you read the introduction to the paper you cited earlier? It’s a good one. > I would be interested to see what Held would say about that. Perhaps I’m wrong. Isaac has a blog. He also has an email. Go ask him. Report. Yes Chubbs, you always have to balance accuracy vs feasibility of any model. We know from CFD what the accuracy to be expected from various levels of “fidelity” are. There is an interesting paper showing that adding convection aggregation to a GCM model led to a change in ECS and a better agreement with precipitation data and tropical temperature structure. I think this shows that GCM’s are not very structurally stable. Now one could argue that convection is more local than turbulence. That would be an interesting discussion to hear. You seem to be playing your “but turbulence” game again. We all know that climate models are not perfect. Noone is claiming otherwise. Clearly there are scales (both spatial and temporal) where they don’t perform well. However, there is little to indicate that you can’t use them to infer things about how the system will probably respond to external perturbations. Warming. The broad patterns of warming. Changes to the hydrological cycle and how this will manifest itself on scales that are well resolved. Changes to circulation patterns on well-resolved scales. If you want to demonstrate that there are real problems that mean that we can say little about these kinds of things, then you’re going to have to do better than claiming that there are issues with free air turbulence. Yes, they’ve known about this since about 2010 thanks to Cassini. Wow. Seems unfeasible. Citation, please! Yes, I must admit that I’m rather confused by that. I’ve never heard of the rings of saturn reversing their orbital direction. How would conservation of angular momentum allow that? I’ve never heard of the rings of saturn reversing their orbital direction. Forgot to mention: caveat I’m not a physicist. Guerlet, S., T. Fouchet, B. Bézard, F. M. Flasar, and A. A. Simon‐Miller. “Evolution of the Equatorial Oscillation in Saturn’s Stratosphere between 2005 and 2010 from Cassini/CIRS Limb Data Analysis.” Geophysical Research Letters 38, no. 9 (May 16, 2011). The Earth’s QBO, which may be considered to be the equivalent of an invisible Saturn ring, has a period (2.368 years) which is precisely commensurate with the repeat pattern of the terrestrial year and the moon’s nodal period. Okay, so you’re not talking about Saturn’s rings. Presumably PP refers to the bands in saturn’s Atmosphere? If so pretty pessimal choice of synonym! T. Mauritsen is the 3rd author of the many more on that paper. So the laws of physics trump a little terminological inexactitude. Experts, arise Phoenix- like from the ashes! Angular momentum is conserved in the aggregated system. Yes, it looks like it’s primarily the inner-most equatorial rings of Saturn and Jupiter that reverse direction. The other outer rings also show oscillations but they aren’t as severe. You still seem to be using the term “rings” in a non-standard way when it comes to Saturn. You’re not referring to the very thin disk that orbits the planet. You seem to be talking about rings in the planet’s upper atmosphere. Yes, as shorthand can call it a ring or a torus or a donut. Families of rings aligned along the equator exist, each characterized by a different radius. For the Earth’s QBO this video is of course an exaggeration in terms of radius but it gets the point across. The point is that when people hear the term “Saturn’s rings” they don’t think of rings in the atmosphere. They typically think of the small icy particles that orbit the planet in a very thin disk. I do hope Paul’s obtuseness is deliberate. Regarding the rings, I apologize for not thinking like an astronomer or climate scientist but as someone who just wants to make sense of the equatorial topology. Another interesting analogy combines Ben’s comment on Jupiter belts and an upthread comment I made regarding observations with respect to vortex patters on a superconducting spherical shell. This spherical topology can recreate Saturn’s hexagonal polar pattern. I don’t think it was intended as an insult. I think it was intended to point out that if you used the term “rings” when discussing Saturn, a well-informed member of the public would think of the very obvious rings that you can even see with a good set of binoculaurs, not circulation patterns in the planet’s atmosphere. We could probably drop this now, as it has probably been pointed out enough. “You are awfully uncharitable in your selective interpretations.”. Irony meter. Broken. Ah yes, Mauritsen & Stevens. I’ve read it. I presume you have an alert set for “IRIS effect”. Once you read it, of course, you’ll realise that it’s just an minor tweak which improves model fidelity, and in magnitude compares to Lindzen’s global-saviour IRIS Effect the way a Tiger Moth compares to an A380. “I think this shows that GCM’s are not very structurally stable.” I know you’re wrong. I’ve read the paper. There have been several other papers along the same line, as I’m sure you know since they’ve been discussed on this blog. Often, IIRC, because you’ve brought them up in the apparent belief that they challenge the validity of climate modelling. They don’t. None of them demonstrates the sort of structural instability implied by the Hawkmoth Effect. Just tweaks to a single regime. Perhaps it’s a very tiny moth? Assuming you brought the papers up in good faith, your failure to comprehend them demonstrates a surprising lack of understanding for an expert. That also informs my Bayesian prior that your assorted claims are highly unlikely to be valid. I’m afraid you’ve set a very high bar for yourself if you’re going to shift that prior, higher than that for most commenters. Also, as I understand it, Mauritsens & Stevens were trying to see how big of an effect the Iris Effect could be. They weren’t actually showing that it operates as they implemented in their paper. Even if you artificially enhance the infrared window in the tropics, you still can’t get climate sensitivity as low as suggested by the proponents of the Iris effect. The reason being that some of the feedbacks reduce the ECS, while others increase it, so that the net effect is relatively small (the proponents of the Iris effect apparently ignored the positive feedbacks associated with an enhanced IR window in the tropics). PP there was no insult. I was just pointing out that if you said something about the rings of Saturn, *very* few people would think you meant its upper atmosphere. If there is something *everybody* knows about Saturn it is that it has a spectacular system of icy rings orbiting around it. Note that I put a quote around the term “Saturn ring”. PP sorry, not interested in that sort of rhetoric. An insult that was never made cannot be retracted and indeed was not. Note that I ignored your associating me with DPY. I am willing to write a guest post. It will be entirely content free. DPY and PP can have a field day in the comments. I think the interesting thing about the patterns on the bands of Jupiter, or the global convection structures of the Earth’s atmosphere, with their zonal bands of winds and jet-streams, is that they seem to get locked in to quite specific patterns. It seems like, a priori, the patterns might change in quite a jerky way as you vary parameters. But, per the discussion above, the Earth’s large-scale convection seems to be quite stable over a fairly wide range of parameters. I’m not sure that has much bearing on the question of robustness of simulation results as you add more and different physics (which I guess is what the ‘Hawkmoth effect’ is about). However, if the output is a non-smooth function of the parameters, then that would pose some practical problems, and potentially make predictions less robust. I think that mostly the conclusion has been that things are fairly smooth (as long as you say with +/-3C or so), but if things like North Atlantic circulation change fairly quickly, I guess that probably has some small overall net effect as well as making some places warmer and some colder. “But, per the discussion above, the Earth’s large-scale convection seems to be quite stable over a fairly wide range of parameters. The robustness of a behavior against perturbations is partly the motivation for applying topological insulator-type models in climate science. It could be that every perturbation or turbulence that you throw at it won’t matter, as the topological constraints force the behavior into a set pattern. Then the Hawkmoth effect only applies in defining what the constraining topology and boundary conditions are. > Then the Hawkmoth effect only applies in defining what the constraining topology and boundary conditions are. Verytallguy, I await your post with bated breath. It will be a cracker I am sure. If the topological model is such that it is robust against perturbations, then the Butterfly effect would have little impact on a set trajectory. This means that only the structural stability (Hawkmoth) will have an impact, so I would concentrate on formulating the topology and setting up the boundary conditions correctly. Boundary conditions are the precise geometry or topology of the sheet and the forcing frequency. I don’t know how hard it will be to predict the 2-D standing wave patterns, but the experiment is controlled and repeatable, so in theory it should be doable. I really don’t think you’ve understood the Hawkmoth effect, or read any of the comment directed at you. That something does not satisfy the stringent constraints of structural stability does not mean that it is structurally chaotic (Hawkmoth Effect). The null hypothesis (if I even understand that correctly) that begat the Hawkmoth effect was that North Atlantic storms (crossing 20W from 45N-65N) would not change significantly even under RCP 8.5. The issue appears to be that two AOGCM’s showed somewhat less storminess (using their thresholds) than the historic records showed. I would, of course, take issue with that null hypothesis, e.g. use temperature anomaly instead at something above a local or regional level. Should be amended slightly to avoid any misunderstanding. The simulations were out to 2100AD compared to the historical record. There threshold was the PDF of distribution of days between successive storms. Again corrections to any of my misunderstanding are most welcomed. Some general information with respect to wind wave modelling. Actually this partially informed member of the public jumped to the conclusion Paul meant the atmospheric ‘rings’ because the orbital rings are largely unidirectional, but like Jupiter, the surface bands are not. But the key point is that while those bands can reverse direction, and wobble with lots of impossible to model turbulence at the interface between contra-rotating bands, the global angular momentum is preserved. Any energy lost or gained will show up in the speed of rotation and temperature change whatever the pattern of turbulent flow it follows to get there. What has always bothered me is that the periodic Chandler Wobble in the earth’s polar axis rotation can be precisely explained by a torquing of the non-spherical geometry of the earth with the periodic nodal declination of the moon and sun … yet this is not close to the consensus view. The periods are precisely commensurate, indicating that conservation of angular momentum of the earth-moon-sun system is likely strictly conserved over time. Surely that would have been a better way to put it? Followed by a demonstration, that in the cases of interest, it does indeed trump chaos. And indeed, that in the cases of interest, chaos does indeed trump deterministic forcing. IOW that it’s not enough to know where the attractor lies, and how big it is, but we need to know where we are on the attractor. Either because it’s too big and encompasses both safety and disaster, or because we need to know where the storm will be next Tuesday, as opposed to knowing that we can expect a Cat 5 sometime in the next forty years, and use design our sea defences accordingly. Then rinse and repeat with Hawkmoth replacing Butterfly. Can we learn to make more useful mistakes and move on faster by leaving Model-land? It’s interesting that apart from hand-waving, and “START so climate modulz wrong”, which is just as silly as “aircraft wings so climate modulz wrong”, the examples are of weather not climate. Perhaps the answer to the second question should be “we think not; AOGCMs are still the best game in town”. As opposed to where we seem to be being lead (which is certainly how contrarians will spin it): “climate modulz wrong, perhaps we can fix it by leaving model-land, but perhaps it all just too Wicked”. Isn’t there a general consensus that for the primary natural variability that one attractor is the annual cycle? And that the phase within the annual cycle is well known? This wave attractor may also be producing a biennial limit cycle. I am interpreting this as the ocean is the source of any long-term order. Paul, I would regard night-day changes and seasons as an extension of knowing where the attractor lies and how big it is, but in this case the forcing (illumination changes) moves the attractor around. Chaotic changes may make some nights colder or some winters warmer, but day will always be warmer than night and summer warmer than winter. That applies equally to structural changes between GCMs, AKA Hawkmoths. AFAIK none of the CMIP suite generate winters warmer than summers. Should we be worried about that? No. I am interested in causes of the natural variability that is not perfectly periodic (e.g. anything outside of the strictly seasonal signal). It is widely accepted and clear that there is a seasonal barrier to variability excursions. If you are not interested in that aspect, fine, but you should realize that we are clearly not discussing the same behavior. Which is fine Paul, but falls a long way short of there being a problem with GCMs because they all show winter colder than summer, and there may be missing physics which stops them showing summer colder than winter. That they all show winter colder than summer is a feature, not a bug. Of course there are more local or short term things which need to be incorporated, especially if you want to predict future storm tracks or California’s climate during future El Ninos or La Ninas. But climate modellers already know those things can’t be predicted with high confidence. They don’t need economists telling them to be cautious about stuff they’re already cautious about. And the fact that those things are uncertain doesn’t mean that we should be uncertain about CO2 being a greenhouse gas and causing global warming. Positing unidentified structural features that might make climate models do things the actual climate hasn’t done for thousands or millions of years is just handwaving at unicorns (that’s directed at contrarians and luckwarmers Paul, not at you). Actually, that’s another reason we can be confident climate models are in the right ball-park. We have records of actual climate on actual Planet Earth not doing Hawkmothy things*. We don’t have to rely solely on models. * Obviously above 3C it gets more uncertain, because what calibration we have to such temperatures had slightly different continental configurations, and very different ice distributions. How do they know what can or can’t be predicted with high confidence? How do they know that they aren’t just missing some crucial piece of the puzzle? Can’t currently. The point is that they’re known unknowns, and the people in the know know they’re unknown. And what the range of unknown-ness is. Not Hawkmoths. And probably not Wicked. We lost one person “in the know” yesterday due to the passing of Walter Munk. He knew these were all related and no one else is picking up on it. Chaos is the focus and L. A. Smith is an author. Thanks, I’ll have a look at that. I see Erica Thompson is the lead author. That’s likely true, perhaps because it turned out to be impractical for solving real problems.